Welcome to the facts about Spain page. 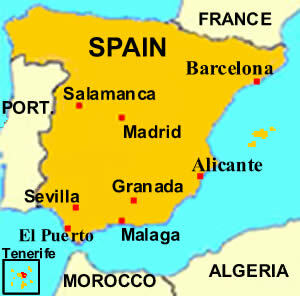 On this page you can find several interesting facts about Spain. The most important facts about Spain are listed here in a practical list. Do you have any questions or comments about Spain? Try our forum! Top 3 Largest cities in Spain: Madrid 5.9 million inhabitants, Barcelona 5.3 million inhabitants, Valencia 1.6 million inhabitants. Population size: 44,7 million in 2006. Density: 88,39 inhabitants per square kilometer. Size: 506,000M square meters (Spain is the second largest country in Europe after France). Mean Altitude: 600 m. (which makes Spain the second highest country in Europe after Switzerland). Highest Point: Pico de Teide in Tenerife 3,719 m.
Tourism: Over 52 million tourists visit Spain each year, Spain is in the top 3 most visited countries in the world. Foreigners Living in Spain: officially there were 3.7 million foreign residents in 2005. Independent organisations such as Red Cross put the number at 4.8 million. Time zone: +1 GMT except Canary Islands +2 GMT. Currency: The introduction of the Euro in 2002 replaced the former Spanish Peseta. Economy size: eighth largest economy worldwide with a Gross Domestic Product just over 1 trillion euros. Labor force: approximately 20 million. Religion: approximately 90% of the population are Catholic and there is freedom of religion in Spain. Measures: Weight measured in kilograms, distances measured by the metric system, temperature measured in degrees Celsius. Spanish Gastronomy: typical for Spain is its Paella read more about Spains Gastronomy in our Spanish Food section. Emergency numbers: They are all toll-free. General emergency services 112. Ambulance 061. Fire service 080. National police 091 (this number is used when there is serious trouble). Municipal police 092. Civil guard 062. Opening hours: in most of Spain the siesta is honoured, but the hours differ between regions. Stores open around 9am and close around one for the siesta, stores then open again around 5pm. More to the south the the stores open later and therefore the siesta starts around half past 2pm. Opening hours banks: In general banks are open Monday to Friday from 9am to 2pm and on Saturday until 1pm. Public transportation: Taking the bus is by far the cheapest way of transportation. You can get a city bus ride for only €0,95 and if you buy a card where you can buy prepaid rides for they are only €0,59. Taking the bus from city to city is far cheaper than travelling by train, e.g., the busride of 6 hours from Malaga to Madrid is approximately 20 euros while a train can cost up to an astonishing 150 euros. Taxi's are reasonably priced; a 5 minute city ride costs around 3 euro. Tipping: Spanish people aren't used to big tips, you can just leave a few coins and they are already more than happy with you. Would you like to learn Spanish? Take a Spanish course in Spain, the best way to learn Spanish! Take a look at schools that we have selected for you. More facts about Spain are easily found on this site. Facts about Madrid, facts about Malaga, facts about Granada, facts about Salamanca, facts about Sevilla and facts about Tenerife it is all here. On the left side you find the navigation bar, just choose the Spanish City Guide you like and learn to know everything about the Spanish City of your choice. You can read about its history, gastronomy and the typical city events. We have also selected the best activities in Spain possible for you. Looking for accommodation in Spain? No problem we have selected the best offered accommodation in Spain . All these facts about Spain are offered to you for free by Spanish Town Guides the best Spanish City Guide!